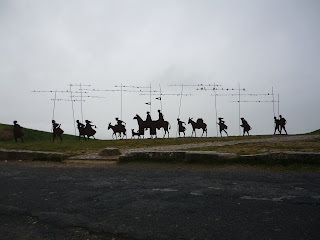 Hyping the Camino: Now this is what I´ve been talking about! Now this was the Camino day we envisioned when we did all our planning. We left our refugio just as the morning light was struggling through the overcast sky. Not an auspicious start, as we took an immediate wrong turn in the gardens of the refugio, but we managed to find the exit and we were on on way through the quiet streets of Cizor Menor. Even though the start of this day was a huge climb of 790m. up to Alto de Perdon, it was on an easy pathway and it was rewarded with wonderful views of the countryside. 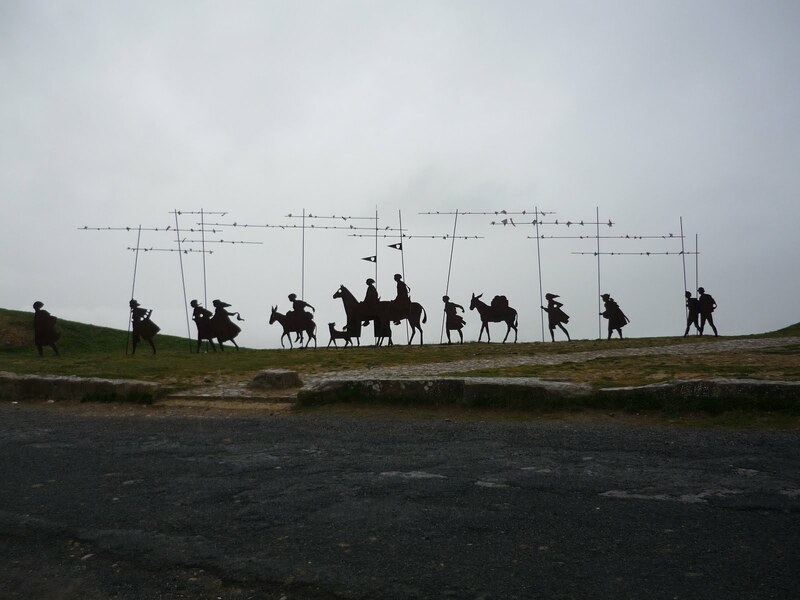 It was exciting to reach the much anticipated site of the famous metal sculpture of Camino pilgrims. We descended down a country path to the small town of Uterga where we had another Camino first; our first real café stop. 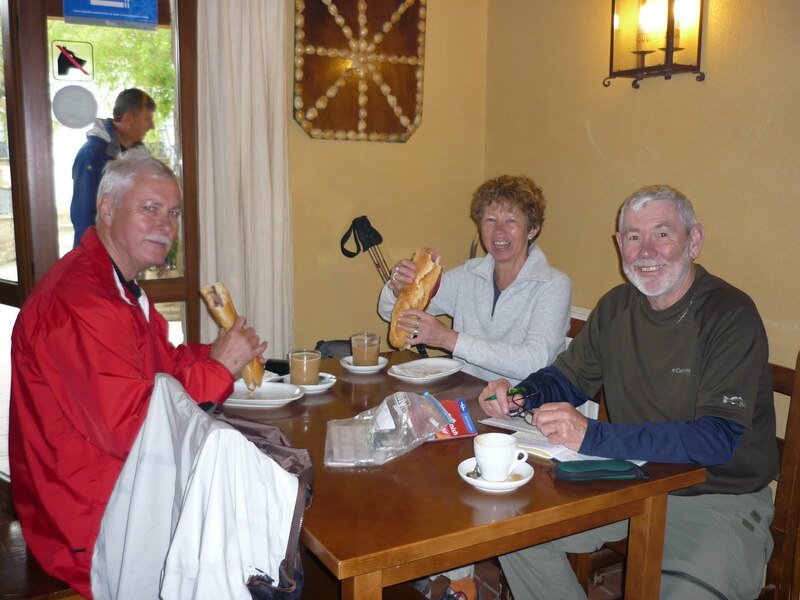 We had café con leches, té, tasty pastries, and the waitress kindly agreed to mail our postcards. Perfect! After that it was an easy walk to Eunate where there is an 11th century hexagon church thought to be built originally for the Knights of the Order of Jerusalem. (I´ll perfect my historical references later). Then we walked on to Puente La Reina. To get to our alberque for the night, we had to trudge up a steep hill for 350kms but it seems worth it; lots of space, separate mens´and womens´hot showers, laundry facilities and a bar. Knees are better and quads have gone from total spasms to a dull ache. Can´t ask for more. 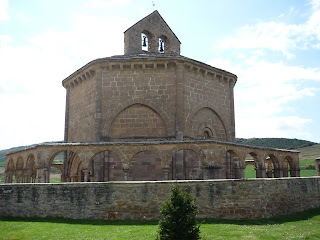 I did have a small epiphany today when it came to me that that perhaps the reason pilgrims who complete the Camino are promised a bit of a dispensation from their time in Purgatory is because they have done penance enough and suffered enough on their Camino. So we´re good for another day. I´ve re-packed the reservation phone number for Air Canada that I was sure two days ago I was going to use to move up our departure date and I´m looking forward to what tomorrow brings. Sounds like your Camino has begun.